by Glenn C. Daman. Kregel Publications, 2008. 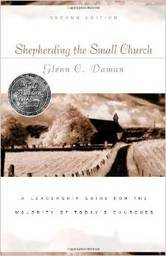 Glenn Daman is an author and former small-church pastor who believes that a church’s vitality is not determined by its size, programs, or budget. Vitality is instead about the church embodying God’s purposes, and Daman’s work offers churches a way to achieve those purposes. Daman begins with a lengthy and helpful discussion of the varying aspects of what it means for a church to be effective. He then offers a five-step process for building an effective church: understand, know, be, do, envision. Each section of the book addresses one step of the process, and each is explored from more than one angle. “Understand,” for example, addresses both the internal and external church context. Included worksheets correspond with each topic, and they are assessment and planning tools designed to be completed jointly by pastors and congregational leaders. This work is most appropriate for Christian pastors and lay-leaders. Available as an e-book.